I know I don’t post too many recipes from my home state Kerala on this blog, but I’d like to change that. I have been spending a lot of time discovering baking; and I often neglect showcasing Kerala cuisine because, perhaps, I find it too everyday and plain vanilla. And also because when I do crave Kerala flavours, I usually don’t make a complicated curry- I rustle up a quick cabbage or beans thoran; a chutney or even a simple raw mango salad spiked with chilli powder and tossed in a little coconut oil and feel satisfied. And usually, these are so fleeting, I don’t manage to capture them in a post. But I would like to change that now. I feel I don’t cook the food of my region often enough; so this warm chickpea salad would be a good place to start the rediscovery. Why? Because it’s so very simple, plus, it’s a festival dish. And also because I have some real memories attached to it. 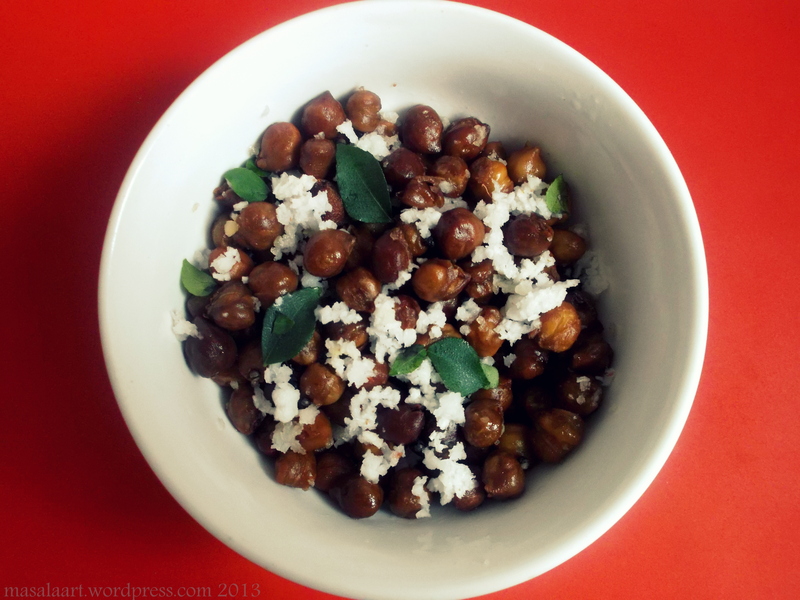 Chundal or sundal is a chickpea salad made with brown Indian chickpeas, and in Kerala it’s made as an offering during the Navratri festivities. The last three days of Navratri are observed in Kerala with homage to Saraswati, the goddess of learning. As kids, we’d place our books in the puja room on the eighth day of the festival, to be blessed by the Goddess. We weren’t allowed to study, write or even read for a day- so you can see why I remember this festival so well! We always made sure our teachers didn’t give us any homework, either! On the tenth and final day, our books were taken out, we used our fingers to trace the words ‘om hari sri ganaptaye namaha’ on a plate of raw rice (or just wrote it on a notebook) and sat down to study in earnest for an hour or two. My grandmom would make a large batch of chundal and my cousins and I would eat a bowlful after our ‘earnest’ study session. But you don’t have to wait for a festival to make it- it’s a great snack or side, and super-quick and simple to make. In a large pan, heat the oil. Add the mustard seeds. When they begin to pop, add the crushed red chilli/chilli flakes, asafoetida powder if using, and curry leaves. Sautee for a about a minute. Add the cooked and drained chickpeas, salt and stir-fry for a minute or two. Sprinkle the grated coconut and mix gently. Pull off heat, garnish with with a few more curry leaves and serve. This is traditionally made with the smaller darker chick peas. I have fond memories of buying chundal from the street vendors after school. They sold it hot off the frying pan in a paper cone and the smell of mustard seeds popping and curry leaves and coconut toasting was so tempting to after-school hungry kids! The picture itself a sight! Chundal is real comfort food ! Yummy and packed with memories of grand moms and festivals. Thanks for sharing. Bring on the Kerala food—that looks delicious and it’s not “plain vanilla” to me! Thanks for the encouragement Michelle- I am going to actively post more regional stuff here!! Thank you ever so much for the reblog. I really appreciate it!